President Donald Trump has repeatedly declared that the United States has won the war against ISIS, but as the Media ridiculed his declaration, and as they flat out called him a liar, the President finally emerged showing a map that shows ISIS-held territory around the globe! It had already been reported last month, where ISIS troops were becoming demoralized, as they found that the “caliphate” Abu Bakr al-Baghdadi was nowhere to be found when the final battle ensued. In fact, there were reports that indicated that the fighters attempted a coup from within his own troops in January and was forced to flee and go into hiding. Then, within hours of the President announcing that the red spot on the map would be gone, reports came in last Thursday that ISIS has officially been defeated in Syria, as the Kurdish-led United States Allied Forces liberated the village of Baghouz, and reports indicated that the Caliphate has been destroyed! According to Fox News, the SDF fighters are now requesting assistance, as they have captured massive numbers of prisoners during the battle. However, not among the prisoners are the top ISIS leaders, as they abandoned their forces, and fled, leaving their fighters to be killed or captured! Still, the Mainstream Media refused to accept his declaration of victory, as some questioned the validity and source of the map. Others throughout the anti-Trump left-wing pro-Marxist Media stated that it is believed that there are sleeper cells quietly waiting in both Iraq and Syria! 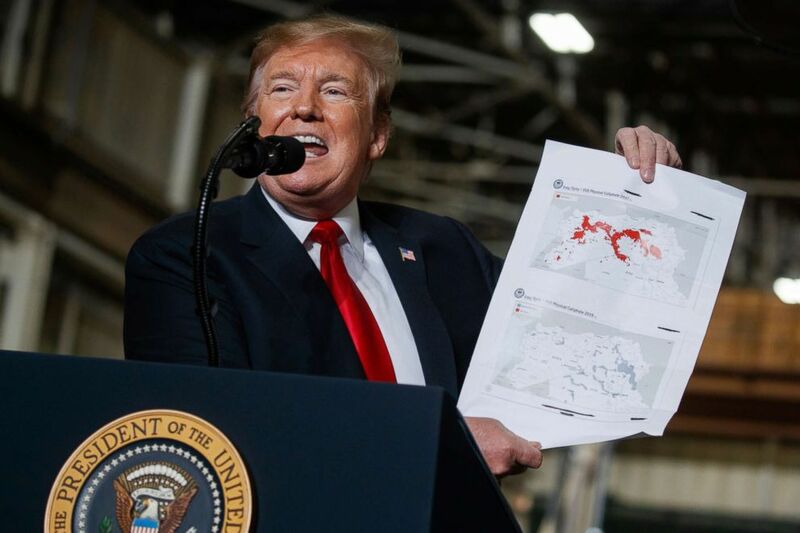 (Evan Vucci/AP) President Donald Trump holds up a chart documenting ISIS land loss in Iraq and Syria as delivers remarks at the Lima Army Tank Plant, March 20, 2019, in Lima, Ohio. However, in the end, it doesn’t matter what the President does to secure our nation, enrich the American people, or bring stability to the world! It doesn’t matter, if the President creates a booming economy with his pro-American policies, safeguards the Constitution, secures our borders, promotes equality for all classes, all races, all sexes, or all religions! After all, the Democrats and their Mainstream Media allies don’t care about those goals and ideals! After all, they are focused on one thing, and that is transforming America from the Constitutional Republic we have had since the inception of our nation, into a Marxist and Socialist Dystopia, which requires removing all obstacles, which means all Conservatives, all Christians, and all especially President Trump! After all, as he works to Make America Great Again, it goes against their agenda, as they strive to push their Marxist agenda and Make America Poor And Divided Again!